DANNY GARCIA: "IF I WAS TO EVER FIGHT BRADLEY...HIS HEAD WOULDN'T COME CLOSE TO ME"
"I feel like if I was to ever fight Bradley in the future, I feel like his head wouldn't come close to me because I'm strong and I hit hard. I'd hit him with a couple of shots and that would back him right up and make him respect me. He doesn't respect a lot of fighters because he hasn't fought a lot of fighters that can punch...I feel I can beat those guys, but when I make my mark in the sport, when I get on HBO, I'm gonna stay there. I don't want to be there for 2 fights because I rushed myself and I got there too fast. 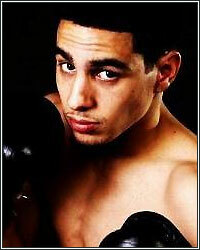 I feel like I can beat them guys right now, but I'm going to wait for the perfect time to sneak in the game when no one is looking and everyone is underestimating me," stated fast-rising jr. welterweight Danny Garcia as he shared his thoughts on Timothy Bradley's win last weekend over Devon Alexander, his own upcoming February 25th return to the ring, and much more. Check it out! PC: How is your training for your February 25th fight progressing? DG: Man, it's going real well. Everything is going as planned. I'm training real hard and just staying focused. PC: What did you think of the Bradley-Alexander fight? DG: I mean, I expected what I saw. Alexander is a real technical fighter and Bradley is real determined. He's going to put that pressure on you. I expected it to go all 12. I didn't expect the headbutt to happen, but I didn't expect for anybody to get dropped. Alexander did get stunned a couple of times from those overhand rights, but it was a good, technical fight. A lot of people thought it was going to be better, but if you really understand how they fight, you knew that was going to happen. PC: What did you take away from each guy and how do you prevent the head clashes if you were to fight Bradley? He seems to clash heads with all of his opponents. DG: Bradley does that to people he can walk down, but if he's in there with somebody that can punch a little bit...I mean, if you're in there with somebody that you feel can't hurt you, you're going to try to walk them down and get real physical. That's just how the game goes. You gotta be physical and take the other guy's heart, and that's what he did. He felt like Alexander couldn't hurt him, he kept that pressure on him and got physical with him, and he kinda took the heart out of him a little bit. But I feel like if I was to ever fight Bradley in the future, I feel like his head wouldn't come close to me because I'm strong and I hit hard. I'd hit him with a couple of shots and that would back him right up and make him respect me. He doesn't respect a lot of fighters because he hasn't fought a lot of fighters that can punch. It's like the announcers said, "If Maidana hits you with a punch like that, it's a completely different story." So if he fights a puncher, he couldn't just walk them down like that without paying the price. PC: Were you surprised that Devon never sat down on any of his punches? DG: I was a little surprised. I was thinking maybe he just wasn't feeling that strong that day, so he was just trying to outbox him and outpoint him for 12 rounds. I don't know what was going through his head, but Devon is strong when he actually does sit down on his punches. I don't know what happened, but Bradley put a lot of pressure on him and took it out of him. You know, pressure can bust pipes (laughing). It's easy to watch it and say he should have did this or that, but when somebody is putting that pressure on you, it's hard man. PC: You told me before the fight that you felt you could beat both Alexander and Bradley. Is that still the case or did something you see Saturday night make you think either guy could be a problem for you? DG: I'm really confident, man. I think if Alexander would've waited 3 more fights, he would have beat Bradley. He's only got like 21 fights. He's still young, man, and that's how I feel. I feel I can beat those guys, but when I make my mark in the sport, when I get on HBO, I'm gonna stay there. I don't want to be there for 2 fights because I rushed myself and I got there too fast. I feel like I can beat them guys right now, but I'm going to wait for the perfect time to sneak in the game when no one is looking and everyone is underestimating me, and I'm going to stay there. I'm going to keep my mark. You will see me on HBO every 3 months. PC: You want to go the Floyd Mayweather route; get on HBO and never look back. DG: Yeah man! I'm 22 years old. I know I can beat those guys, but I don't want to rush into something and then something bad happens like what happened to Alexander. So what I'm going to do is keep getting my experience; a couple more fights, you gonna see me on there when I make my mark. I'm gonna be there. I ain't gonna go nowhere. PC: That's what I like to hear from a young fighter. Best of luck to you on the 25th and hit me up any time man. DG: I will definitely hit you up. Thanks for having me on.